PipelineDeals, the most adopted CRM among small and midsize businesses, announced it will be sponsoring Lemonhaze, one of the largest conferences focused on business opportunities and challenges in the emerging cannabis industry. PipelineDeals CRM to address cannabis industry sales growth at the Lemonhaze Convention. According to BDS Analytics, 2017 cannabis industry sales totaled $9 billion which is equivalent to annual revenue from Pampers diapers or annual revenue from Microsoft’s gaming division. The report also revealed the largest group of cannabis buyers are in North America and the potential growth will skyrocket to $47.3 billion within a decade. Since onboarding its first cannabis industry clients in 2017, PipelineDeals has helped cannabis companies build customer loyalty and repeat business. Werlin will be a speaker at Lemonhaze’s Technology Panel on October 26th to offer expertise about how customer relationship management software brings in new business and helps maintain a full sales pipeline. 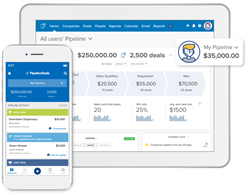 Founded in 2006, PipelineDeals is the most adopted CRM for small and midsize businesses, empowering sales teams across a breadth of industries to build game changing relationships. PipelineDeals is built around an easy-to-use and customizable user experience, sales focused features, and leading customer support and service. Today more than 18,000 users in 100 countries use PipelineDeals to gain visibility into their sales pipeline to accelerate opportunities and close more deals. Headquartered in Seattle, WA, PipelineDeals has made the annual Inc. 5000 list since 2014, recognized as one of the fastest growing companies in the U.S. Try PipelineDeals by signing up for a 14-day free trial or engage with PipelineDeals on Twitter.